Sing! 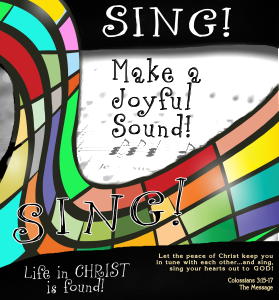 Make a Joyful Sound . . .
One of the remarkable Big Things God has done in my life over the past years is the Facebook Hymns. I grew up in a wonderful Christian home and church where music and singing was always around. When I found myself in this painful, deep dark of the soul I immediately drew on my memory of the songs of my faith through the years. Even more amazing was that in the middle of radiation, pain, confusion, and chemo, I remembered those songs … including ALL the words of each. I began to post those songs and invite my Facebook Family to sing along with me. To my astonishment, literally thousands and thousands sang with me in a chorus of praise around the world. Posted here is my commentary and words of those songs. Worship The Lord with gladness; come before Him with joyful songs. Know that The Lord is God. It is He who made us, and we are His people, the sheep of His pasture. Enter His gates with thanksgiving and His courts with praise. Give thanks to Him and praise His name. For The Lord is good and His love endures forever; His faithfulness continues through all generations. Shout for joy to The Lord, all the earth! Psalm 100: 1-5. Oh, the strength and gratefulness of being blessed with Travis Avenue as my church home. The music that was sang first in our home and taught at church. The strong music ministry gave us directio, commitment, team work and leadership. I think I learned more scripture through sining God’s Word. It was engraved in my spirit. The church tgave me strength through many dark, sad days in our family. Through all our heartache and dispair, I watched my mother stand strong and never waiver as she endured her oldest daughter at death’s door twice during her teenage years. She remained faithful in her walk with Jesus, and a testimony to many of walking by Faith not by sight.